Well, blogger or business owner, we all need business cards and a bit of cash. That being said, I have teamed up with The Charisma Media Network to provide a giveaway sponsored by Day 2 Day Printing. 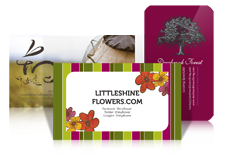 They offer professional printing services at affordable prices including bookmarks, business cards, event tickets, window clings and much more. Did I mention they also offer a 100% Customer Service Guarantee? Each one will win 250 business cards and $20 cash! Enter on the Rafflecopter form below between May 11 12:01AM EST to May 27 11:59PM EST. Open to US, 18+. Please take the time to check out our other giveaways while you're here. Disclaimer: Please view my full disclosure. Winner announcement will be provided by the Charisma Media Network . WOS is not responsible for prize shipment. I would give these to my sister-in-law, who has her own dog grooming business! i will give them to my cousin to use! she could use them for sure! Raging Grannies need new cards. I run my own candle making business from home so I would use them to promote my business! Thanks for the opportunity!